The week of Thanksgiving, I started taking my kitchen back. I was ready and (somewhat) excited about being back and making my things again. One of those things I make is our bread. I'd baked several loaves before Noemi was born, but we'd gone through those the first week and haven't had my good bread since. My sourdough barm was in the fridge for 4 weeks. (Because I just had a baby.) I've been craving my bread, and I finally got to the place where I felt like I could start baking again. So I pulled it out of the fridge, and this is what I found. Anyway, then I scraped (with a wooden spoon) back the top layer because it is grayish in color, and got some of the barm closer to the bottom of the bowl. Just a little bit. I discarded the rest. It's alive! That's what those bubbles mean. I fed it again. In the morning, I made a sourdough pancake cake for breakfast, yum! Since I used so much of it, I didn't have to discard. I hate discarding, but sometimes it's necessary, I know. That recipe is nice because it uses up a lot of barm. And fed the barm again. I let it sit on the counter all day, and then that night I started making my sourdough bread. The kids and I were so happy to have some bread again! I made this on the day before Thanksgiving, so that's all we ate before our Thanksgiving dinner. We had it toasted with butter, and it was lovely. All that to say, if you leave your barm in the fridge for an extended amount of time, just try feeding it before you throw it out. It may take several feedings to get it really active and tasting less sour, but it'll most likely come back. Or, if you're a more prepared person than I am, you can freeze your barm. I've left mine in the fridge for a couple of months before though. And it came back then too! Looks lovely - and that baby photo of Noemi in the side bar is too cute! Could you please share the sourdough pancake cake recipe? Sounds delicious. And I added the link to the post, I knew there was another link I needed to add, but I forgot last night! Thanks for the reminder. And it really is a delicious recipe! That bread looks so delicious! I've made bread many times, but never sourdough. 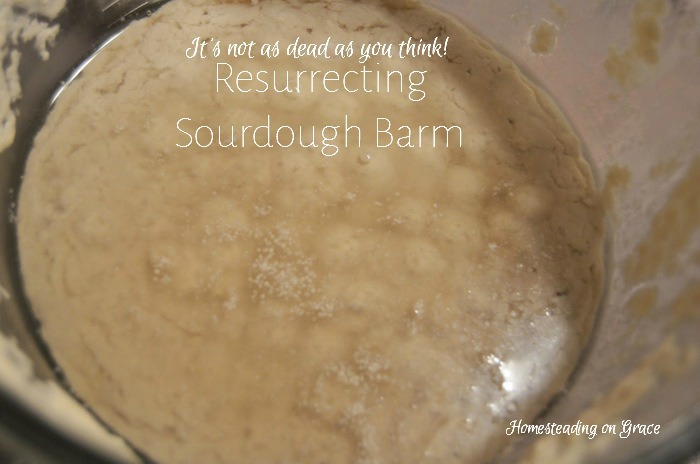 These are great tips which I will pin for when I take the plunge and try sourdough! Found on Thank Goodness it's Monday. Thanks Janet! Sourdough is a different beast, but so much fun! Talk about being thrown under the bus! :) Because I have to post this as anonymous, since I can't figure out the other ways, yet, you'll just have to guess who wrote it! It was nice to meet you at my blog today, Jennifer. You have a lot of good info here! I've never made sourdough bread, but would love to one of these days. 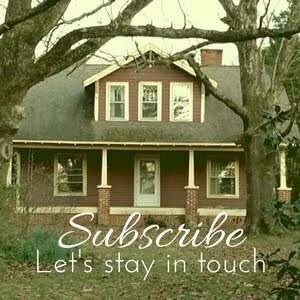 Your blog looks like a great resource! Thanks Jill! I'm excited about reading your blog too, you have lots of great ideas! Jennifer...now, you've inspired me to go and make some sour dough bread. Great tutorial. I'm glad not all was lost. And your daughter has a beautiful name. Okay...I'm partial to it since its sort of the same name as mine. Noemi is Naomi in Spanish, so I've been told. Glad you shared at Monday's Musings. Have a fabulous week. It is the same name as yours! We chose this version because of the n, o, and e, each of our kids' names have those letters. Neat, huh? Thanks for reading, Naomi! This makes me want to start up my sourdough again. I didn't realize you could freeze it or keep it in the fridge so long! Oh you should, it's so fun. It's a pretty resilient thing too, it's hard to kill it completely. 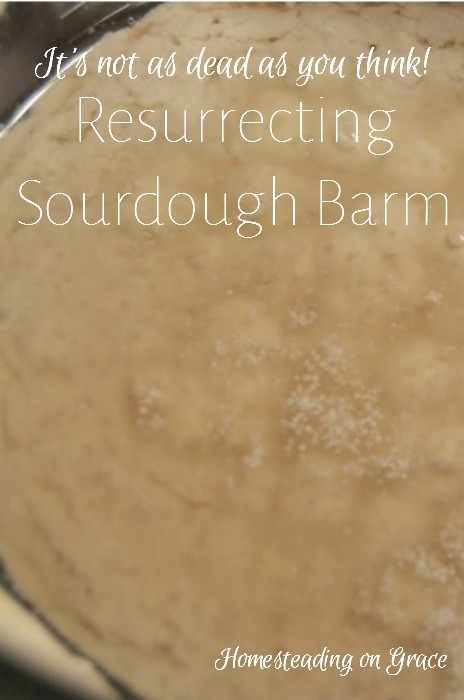 Many years ago I had a thriving sour dough culture, but over time I didn't use it enough and I finally threw it out. I wish I'd known how to do this. Thank you for sharing this on the HomeAcre Hop; I hope you'll join us again this Thursday. I hope you can get your hands on some more sourdough! It really is resilient stuff, especially if I can keep it alive. I'm the type of person who kills house plants for a living. Great post! 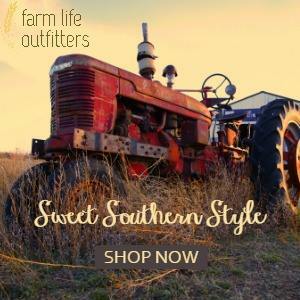 Thanks for linking up to the From the Farm Blog Hop last week! I chose this as my favorite and it will be featured on tomorrow's Blog Hop post!